I'm so excited to share with you, I won 3 awards in London this January. Out of thousands of entrants, only a small minority were awarded the Rosette. I'm so excited to share with you, I won 3 awards in London this January. Out of thousands of entrants, only a small minority were awarded the Rosettes. To see my work on the winners wall is a fabulous feeling, with entrants from all over the world entering the well known competition. Upon choosing the images I need to figure out which category they are best suited for. This is important as it can effect the points awarded for each image, each image has to obtain 80 and above for the rosette which is no mean feat! Wedding Reportage was won with Hannah & Graeme Simpson at Knowsley Hall.... Fashion with Bethany Cammack on a workshop and Avant Guard in Liverpool Library was with Wendy Chiu Eric Ng using Phottix Professional Photo Accessories lighting on a Pre Wedding Shoot.. Words can't explain how exciting it was to see them with their rosettes. I had 1 winner last year and now 3... is just phenomenal. BEHIND the AWARD WINNING Workshop Photograph!!! This image was taken on our last workshop in 2018. With Beth Cammack as the model, taken at Ainsdale Beach, Southport which was our last stop. We had 8 attendee's on this workshop with each attendee having the opportunity to photograph this award winning shot, as I'd set the image up first. To make this award winning it's all about direction with the model and complete refinement. Also waiting for the sun to pop out of the clouds at the right time, creating just the right amount of contrast, lighting Beth. What makes this an award winning image? I love the contrast between the dainty beauty of the dress and model against natures beach grass and weathered wood panels. The position of the pose from the bending of the legs, pointing of the toes, to the perfect framing of the face with the arms grabbing the hair. The way the grass almost flows with the pose in the same direction, the opening of Beths mouth gives it more a sense of reality, also breathing in during the one shot lifts Beths chest ever so slightly accentuating her pose. This shot is more about attention to detail with the pose making it as real and refined as possible. The dress draping over the side adds the fashion the shots needs for the fashion category in the awards. Shooting through the grass on the bottom also adds the sense of depth it needs for Beth to pop. I couldn't have chosen a better model, she absolutely nailed this pose. Reportage Category Photograph from Hannah and Graeme's wedding at Knowsley Hall. This shot was taken straight after the ceremony, as the couple walked through heading to their group shot. I've shot similar images to this as this venue is one I shoot at most months, so I knew I wanted to create a shot that resembled this one, it's just everything had to fall together perfectly even me being at the right place just at the right time. I'd actually never noticed the horse paintings until I started to plan the shot in my head. So timing has to be perfect, not only for the light but for the position of the walk by the windows the room they are in. It's the freezing of the specific moment of the legs that makes this shot so refined. I couldn't meddle with the shot it had to be 100% natural, plus I wanted it that way to make it look as genuine as possible. 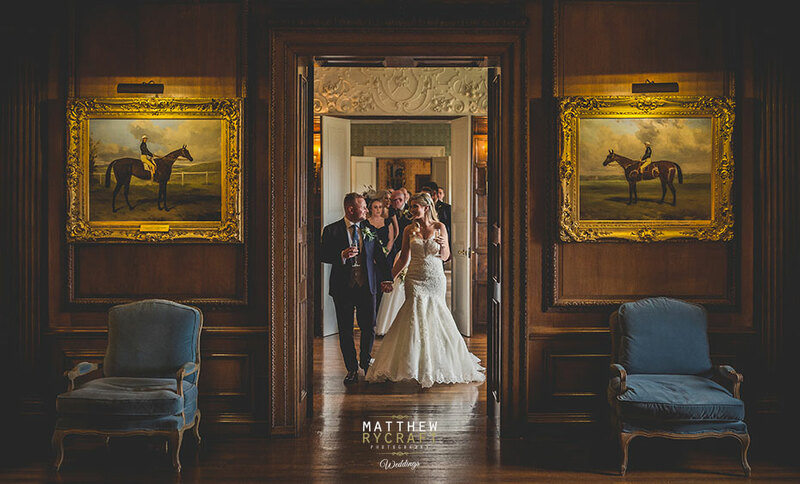 I've specifically framed the couple in the doorway, the paintings of the 2 horses facing inwards either side of the doorway helps balances the image out, but also points towards the couple. The balance of chairs evens the image out even more, leading your eye-line straight to the couple, who are highlighted right in the centre will helps guide your eyes. Graeme is perfectly one step ahead of Hannah to allow light to fall on his face to allow you to see his expression. The guests following in the background creates the story and gives the shot meaning. And you can go as far to say that colours here make the image even more powerful, Blue and Orange are opposite on a colour wheel, and we all know that colours opposite each other compliment each other.... MIND BLOWN..... Who'd imagine you'd get all this information from one shot, most of it without knowing, but its the attention to detail which always makes an image award winning and what makes this a Matthew Rycraft wedding day. This is one of my favourite images, taken in Liverpool Library. It was quite a spontaneous photograph. 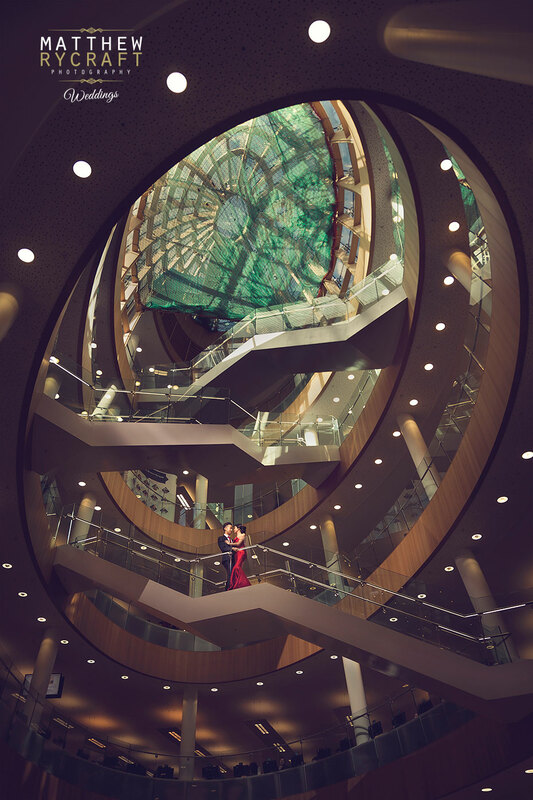 I've always wanted the photograph in the library and with this being a pre wedding shoot we had a little bit more time to perfect the shot. I wanted to capture the repeating oval pattern of the architecture to also include central point of interest being the couple. I used a Phottix Flash Speedlight directly opposite the couple being held by an assistant on a pole, which when flashed highlighted the couple. We where in there for about 30 minutes to get this one shot as I didn't want anyone else in the shot. We where lucky enough to have the light falling through the ceiling, so lighting the couple didn't seem out of the ordinary, as light was flooding through anyway. This is what makes this look so real. We were lucky enough to get permission to photograph in the location and the results speaks for itself.